All of us at Sparks Group are excited to announce that Lin Lee has been named Employee of the Quarter for internal staff! 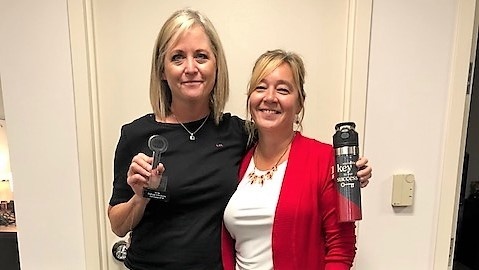 Ms. Lee, the Territory Manager for our Office Division's branch in Chantilly, VA, was selected for this award through a peer nomination process, with final decision being made by Sparks Group's executive team. "Lin started with Sparks Group in mid-2017 and immediately hit the ground running," said Tracy Boyers, Regional Director. "She quickly took initiative in every aspect of her role from operations, to recruiting, to sales. She immediately set goals to get out and meet each client, in addition to leading her team. Lin is consistently out in front of her clients; she always makes herself available to [the Business Development team] to ensure that she has a good relationship and thorough understanding of each client’s needs. She is always pushing and encouraging the recruiting team on a daily basis and comes up with fun contests to keep everyone engaged. Her leadership is much respected from the recruiting team and they know she will jump in and do whatever it takes to help them."